The smooth, stylish marble-pattern top surface of heavy-duty rubber is easy to sweep or damp mop, and is available in multiple colors to match any surrounding. 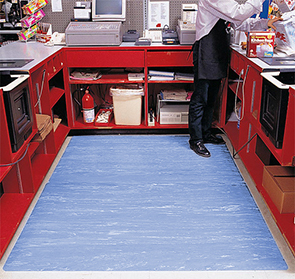 This anti-fatigue floor matting alleviates foot, back, and joint pressure and stimulates blood circulation without taking away from the professional aesthetic of the environment, ideal for labs, check-out counters, banks, and pharmacies. Revolutionary UniFusion™ bond technology uses heat and pressure to fuse the top surface with a dense closed cell foam base creating a 1/2 inch thick floor mat. Sloped beveled foam on all four undersides allows for easy access onto and off the matting. Custom lengths available in 2', 3' and 4' widths, up to 75' lengths. Durable, easy to clean SBR Rubber top surface. Safety beveled edges minimize trip hazards. Performs well in all dry work areas. RedStop™ engineered technology eliminates mat slippage on smooth surfaces. When ordering custom sizes please indicate required length of each mat in inches; and number of mats desired in the quantity box. Sold by the Lineal Foot; price is based on the sum of the total length of all mats ordered, rounded up to the nearest foot. Mat Hold - rubberized mesh pads that adhere to floors and undersides of smooth-backed carpet mats. Perfect for keeping floor mats in place with average traffic. Mat hold pads will not stain carpeting or floors, making them great for any commercial indoor setting.